There can never be too many cooks in this chef's kitchen! 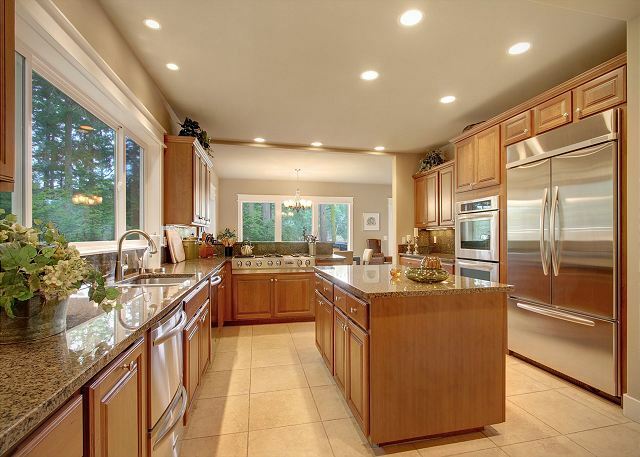 Ample room, double ovens & more! 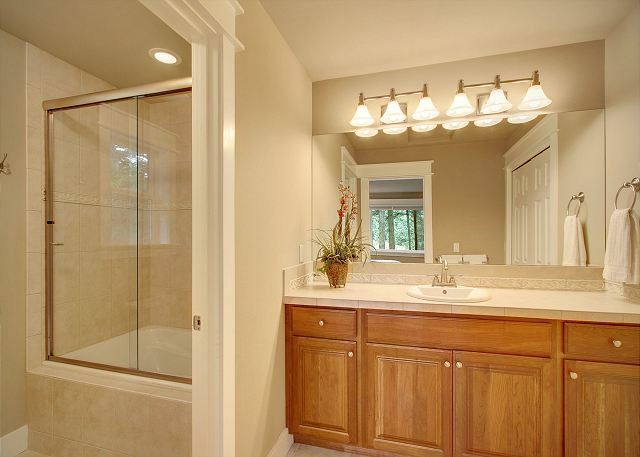 Luxurious master bath featuring large soaking tub, separate shower, dual sink vanity & walk in closets. 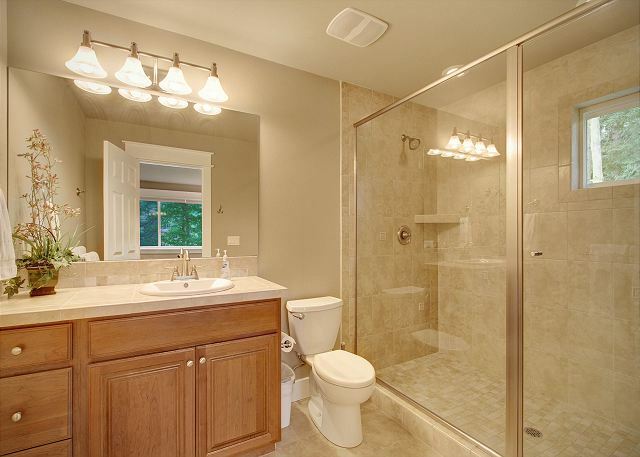 One of the elegant & spacious upper level bathrooms. 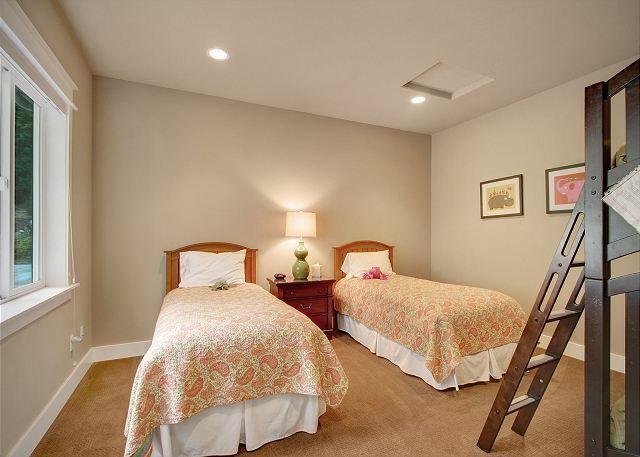 Main level bedroom furnished with 2 twin beds & a set of twin bunk beds. There is a bath just outside the room. Roche Harbor Manor is nothing less than an elegant island getaway. From your first step in you’ll find beautiful tiled floors and a beautifully appointed living room with a stone surrounded propane fireplace. Look out to Neil Bay and the expansive deck for outdoor enjoyment just steps from the water's edge. Enjoy catching up with family and friends in the spacious, fully equipped kitchen complete with stainless appliances and granite countertops. The wonderful waterview dining room offers comfortable seating for 8. The lower level offers two bedrooms. The main level master suite boasts waterviews along with direct deck and hot tub access (Hot tub available at no charge May through September. During the off-season, the hot tub can be made available for a $250 fee per stay), a private propane fireplace, a king sized bed, flat screen television with satellite service, and a master bath that is sure to please. The spacious master bath is complete with heated tile floors, dual sinks, relaxing soaking tub, and a spacious tiled shower. The second lower level bedroom is furnished with one twin bunk bed set along with two additional twin beds (4 twin beds total). The comfort continues for the rest of your guests upstairs. Each of the two upstairs bedrooms enjoys waterviews, is furnished with a king sized bed, a flat screen television with satellite service, and has a private ensuite bathroom beautifully finished with tile and granite. One suite offers a tub/shower with tiled surround, while the other offers a spacious, tiled, walk-in shower. Also upstairs is great media room with waterview and private balcony. Read and relax or catch up on the days events watching the large, flat screen television. 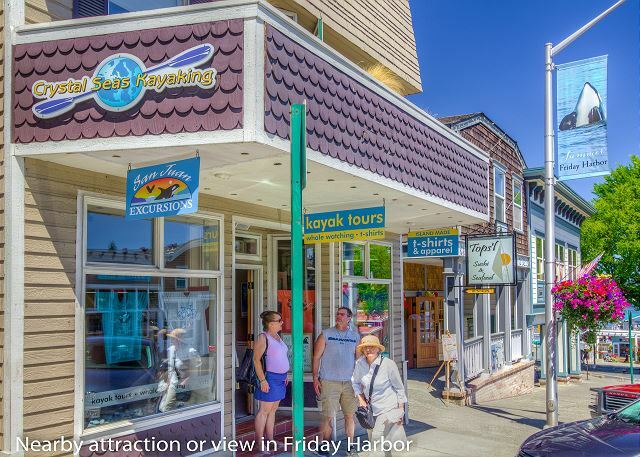 Explore the waterfront of Neil Bay or walk to the nearby Isthmus beach and see the boats traveling in and out of Roche Harbor. Roche Harbor Manor is about a 1 mile walk to Roche Harbor Resort. If you are looking for a beautiful vacation home to share with family and friends, look no further. This beautiful home was very comfortable for multiple families to stay and not feel crowded. It was well furnished, clean, and met all our needs. A few things we enjoyed the most were, the kitchen and dinning room area (this is where we spent most of our time,) walking down to the bay and around the neighborhood, and the many kids toys we found upstairs in the TV room and downstairs closet. We had a little issue with our toilet running through the night but shortly after contacting the property management they quickly had someone out to repair it. Overall we had an amazing stay and would highly recommend this home. This house was perfect - it was completely stocked with everything we needed, plenty of room for all of us without feeling crowded, perfect distance from town for a great walk, and in a very beautiful and serene setting. This house is gorgeous! We didn't want to leave. Have already recommended it to several people, and will probably come back myself. We thoroughly enjoyed our week's stay ay Roche Harbor Manor. The home is beautiful, well-maintained and feels like a comfortable home. The kitchen is extremely well-stocked with dishes, cookware and cleaning products. We enjoyed the abundant selection of games and books (for children and adults) and soaking in the outdoor spa. 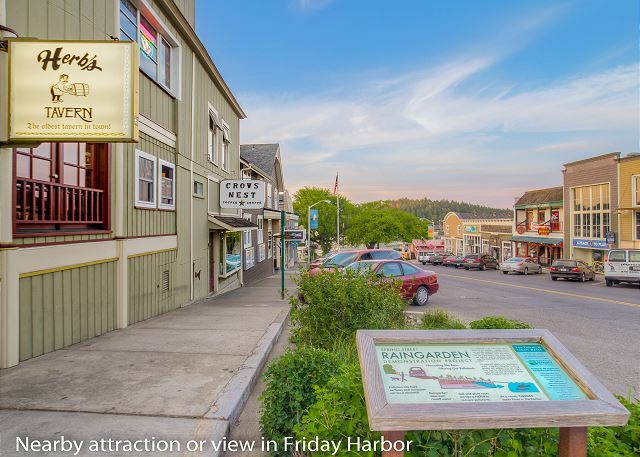 The Location is in a beautiful, serene area and just a short walk or bike ride into the village of Roche Harbor. The management company was easily the etched by phones and very responsive to questions and minor problems. Thank you for a great stay in this beautiful property! We came with family for a summer get away and low key birthday get together. The house was super clean, amazingly stocked and in a great location! Beach combing and walking to Roche Harbor were fantastic. Would definitely book it again! Beautiful home in amazing location. The home accommodated our family of 10 very comfortably. The home & kitchen were furnished very well complete with some books & toys for our 2 grandchildren to enjoy. Cooking & eating together was great with all the amenities of home. We woke up to deer roaming in the woods outside our bedroom windows, bald eagles soaring overhead & even had a visit from Jeff the seal. Skipping rocks & exploring the beach area for sea urchins was so much fun. The 2 decks & hot tub were a bonus. We had a blast & our time spent at Roche Harbor Manor was magical not to mention Friday Harbor and all its natural beauty & of course the whales. Beast family vacay ever. The home will not disappoint you. We had a small family reunion of 9 people at the Roche Harbor Manor. The home and property were fantastic. The home is everything we could have hoped for! The kitchen is very well stocked with anything you can think of needing, 2 dishwashers, plenty of work space! Nice washer/dryer. Air conditioned. 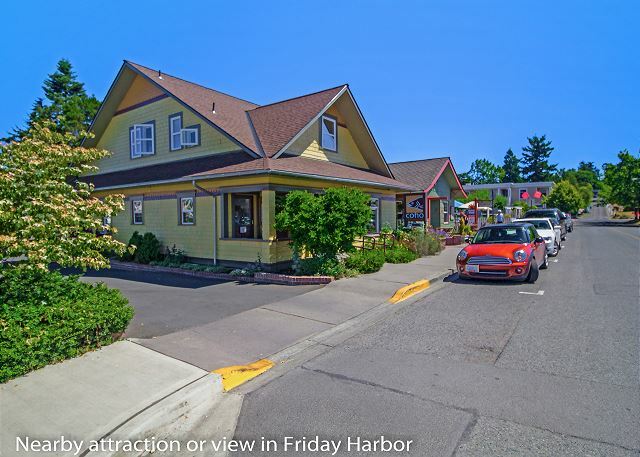 Property is an easy 20-25 minute drive to Friday Harbor. Beautiful surroundings! A river otter lived in the bay and it was fun watching all of the wildlife. Wonderful back deck. We spent a lot of time out on the deck enjoying the view. I would definitely recommend this property and it is well managed by the property management company. Excellent communication with me throughout the stay (emails and calls when needed). Our family of 8 thoroughly enjoyed our stay at this fabulous house. 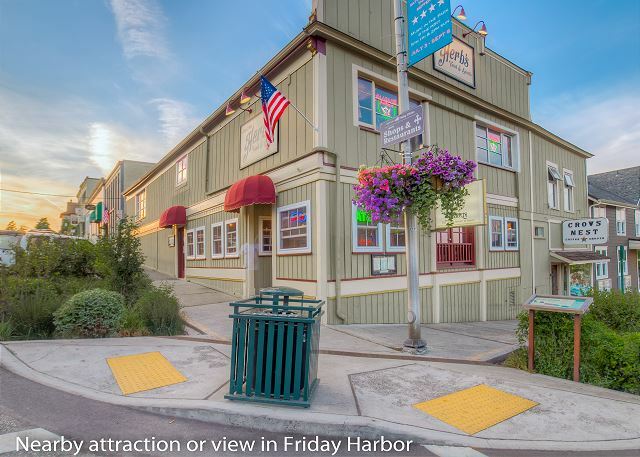 It is located walking distance from Roche Harbor and a short, scenic drive from Friday Harbor. The house is immaculate and well stocked. The bedrooms were large and most had a water view. There were daily visits from a family of deer and several bald eagles flew by. We definitely would recommend this house and look foreword to a future visit. From the moment we arrived, this house was just perfect for our extended family as we prepared for our daughters wedding. Master suites were perfect, plenty of parking, and very well outfitted for us and accommodating a large breakfast after the wedding. We can't wait to come back for another function. The house was lovely. My son was getting married at Roche Harbor, so the location was perfect for my family. We were very comfortable in this property. Overall, the property fit our group well. The table, kitchen, and clothes washing equipment are clearly sized to the sleeping capacity that the rental advertised. It was clean, including the hot tub, and even marginally so with the aging BBQ that still worked. The location offered a nice but not outstanding view. It's nearness for walking or driving to Roche Harbor was a plus in our experience. We could not make one dishwasher work, but the other two and the utility space were quite adequate. With four children playing in the space in front of the garages, the privacy of the property was a big plus. We loved the house! 4 couples slept comfortably, and truly enjoyed the enormous kitchen. Many birds and deer were among us, and the sunrises were spectacular to watch as the bay woke up every morning. Our group of five couples get together every year at a new location, and have been doing this for more than 20 years. 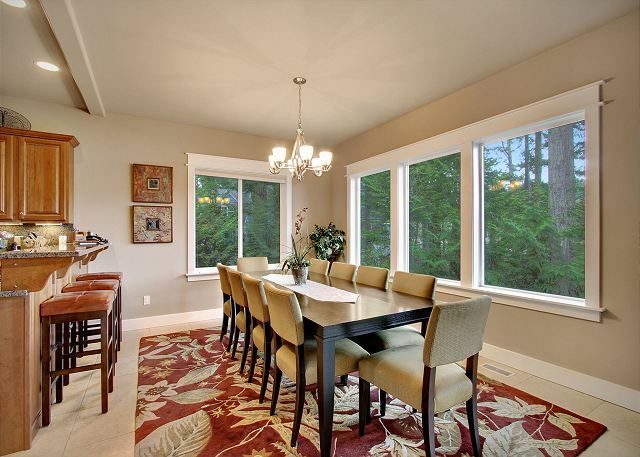 We all decided that Roche Harbor Manor was the most fabulous home we have ever booked! From the fully equipped kitchen to the beautiful deck complete with hot tub and outstanding view of Neil Bay, this house was a dream.Deer outside our windows every day, five minutes from wonderful Roche Harbor and 20 minutes from Friday Harbor makes this a perfect vacation home for family and friends to rent. San Juan Property Management Company was absolutely wonderful with which to work from the booking, to a map directing us to the home upon arrival in Friday Harbor to bringing more towels immediately upon our request. 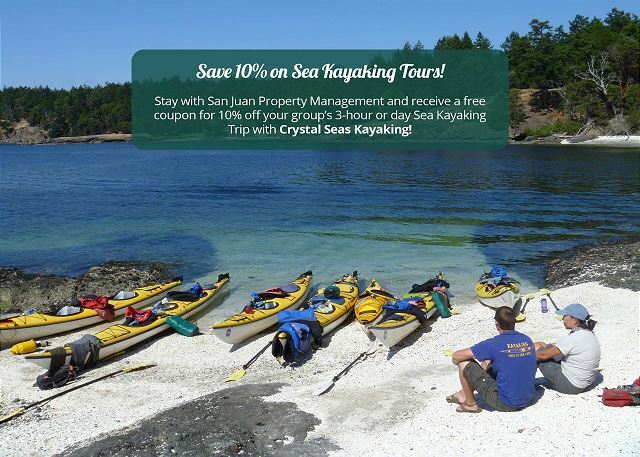 We highly recommend them to anyone going to San Juan Island. The only improvement wanted by the husbands in our group was that the TV cable have sports channels, so that they could check on teams they are following, no big deal for the wives, however! Fantastic home for a family getaway. We had four kids ages 8-14, four parents and two grandparents from across the country and found the home to be a perfect fit. 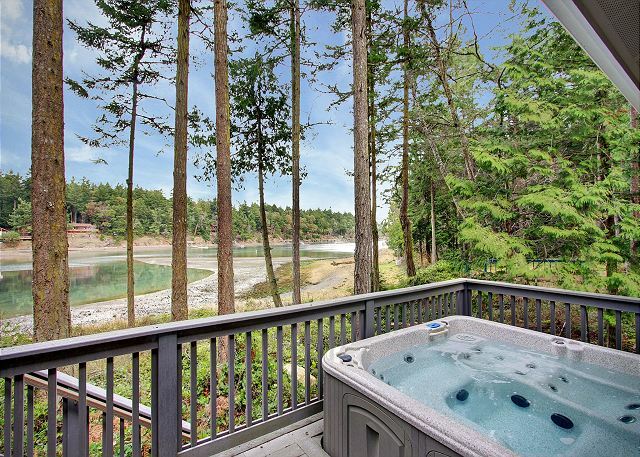 There are incredible water views just a short walk from the house and you are in walking distance to Roche Harbor. All in all, we loved the house and would stay here again. We had a great time here with 4 adults and 3 children. House was very clean and well stocked with everything you might need. Property Management Company was very responsive and accessible. And harbor seals came to visit every night when the tide came in! The house was absolutely gorgeous. The atmosphere was relaxing and inviting. My family really enjoyed watching the deer and seals. Management was very friendly and helpful with any and all questions. They even called during our stay to see how everything was going. The only thing I wish was different was a better path to the bay (Maybe a small fence to hold back natural growth). There is also no yard for kids to play. Overall I would highly recommend this property. This is one of the multiple times we have stayed at this house and it was just an amazing visit as it has been every time. The owners have done a great job with decor, cleanliness, layout, comfort and providing everything you could ever need. The view onto and access to the bay and the abundant presence of wildlife also can't be beat. And as always SJPM is just an excellent rental management company to do business with as a renter. Consistently amazing and awesome rental! We love renting this house, and have rented it several times. Everything is always very clean, excellently appointed, wonderfully maintained, easy to use, comfortable and spacious. Everyday there we are entertained by watching the local wildlife in the bay. San Juan Property Management, whom we have used for three years, also is excellent, professional, courteous, and helpful; Chris and Becky are so nice and always go the extra mile. We cannot recommend this house and SJPM highly enough! my wife and I and 3 other couples rented the subject property for a week. After looking at all the five star reviews from previous guests, we know we were going to be very pleased if the reviews were honest, or very disappointed if they were not. We were not disappointed in the slightest. The house was very clean as we arrived, the rooms were large and well appointed, the kitchen had a great spice cabinet, and the house was missing absolutely nothing. Nice view, just a great place to relax. This home is absolutely beautiful. The setting is fabulous. Close to Roche Harbor. There are three master suites, which was a requirement for we three couples visiting the area. A place to BE, TOGETHER, in solitude, silence, and stillness. We were back in Seattle visiting friends and family and wanted to spend a few days on San Juan. Our experience couldn't have been better. The house is very spacious for multiple families. It was clean, comfortable, and the large kitchen was perfect. We frequently ran into dear and even had a seal or two come into the bay each evening as the tide came in. 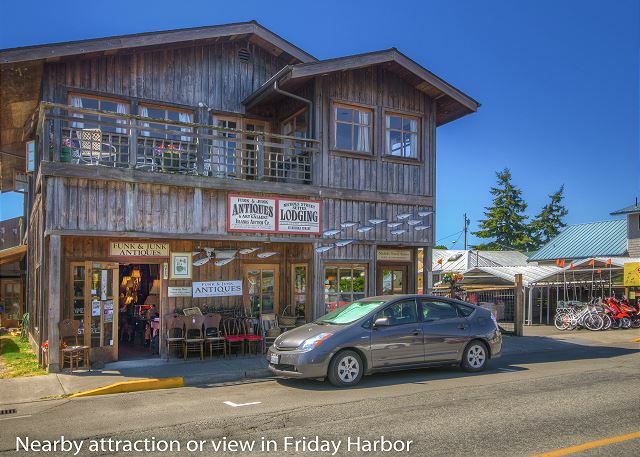 It is an easy drive over to Friday Harbor for more activity, but was out of the way to provide a relaxed stay. Would have been nice to be on the exterior of the island to have an opportunity for additional whale watching, but knew that going in and did an actual whale watching tour. 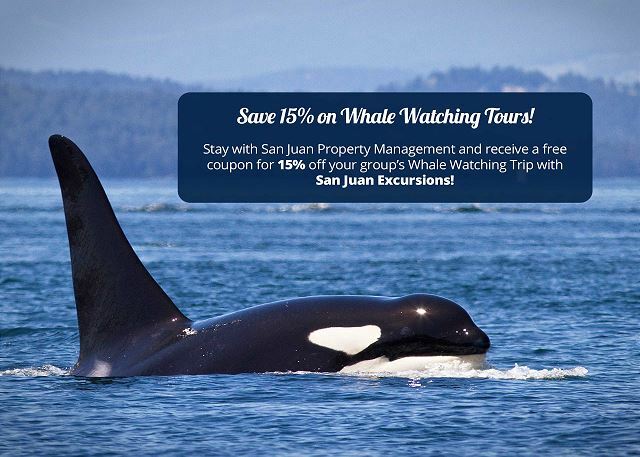 Didn't use the property management company at all as it wasn't needed, although they did provide recommendations for activities and received a 15% discount on whale watching. Wifi was great. The house was everything and more than expected. We enjoyed the property during our holiday stay. 1. 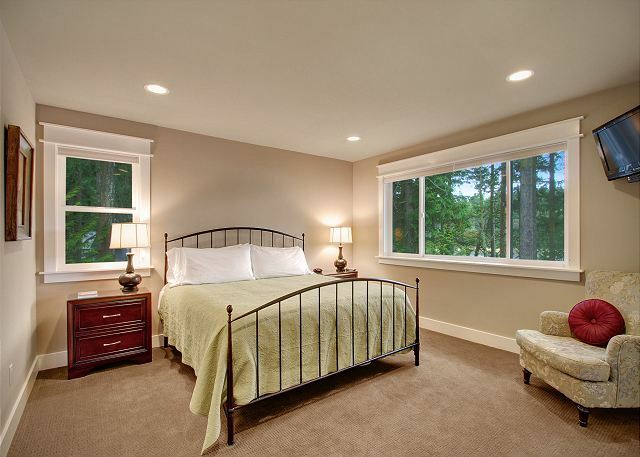 There were 3 master bedrooms, each with a sitting area, and one room with 4 beds. There were so much space in each room that makes you want to just hang out in your room and read or rest. 2. Owner spared no expense stocking up the kitchen. it was so much fun cooking in that kitchen. I was happy to find all those seasonings in the kitchen cabinets. Wish the property manager had told us ahead of time so we didn't have to bring our own. It is the best party house I've ever rented. Great location and the house is set up perfectly as a rental. The house is lovely but you don't feel like it is too fragile to be just enjoyed. The kitchen is great for a crowd although there were only 7 of us. Beds are very comfortable. Living room is spacious. We were all glad that the tv was not the center of the living area. We had a lovely time just being together in a gorgeous location. The only negative is that the property needs to be sprayed by a professional for spiders. We killed a number of spiders, mostly in the bathrooms and the front entrance. 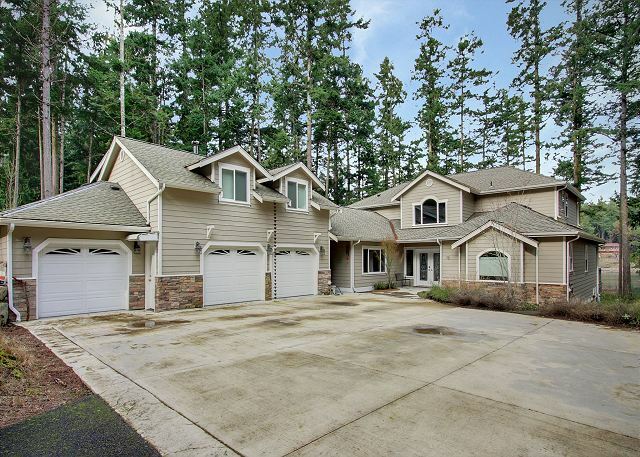 This is a lovely spacious home near Roche Harbor. We stayed a week with our two kids, 11 and 12, and their two grandparents. The property was in immaculate condition, much nicer than most houses we have rented over the past 15 years, with great attention to detail. Nice touches like elegant throw blankets and sharp kitchen knives (we love to cook) made us feel very much at home. We had one issue with the cooktop burner that was rectified quickly. Communication from management company was prompt and helpful. The home is situated on a nice little calm bay. It would have been nice to have a kayak or rowboat to explore it a bit. The cycling around the island is stunning albeit a bit hilly. 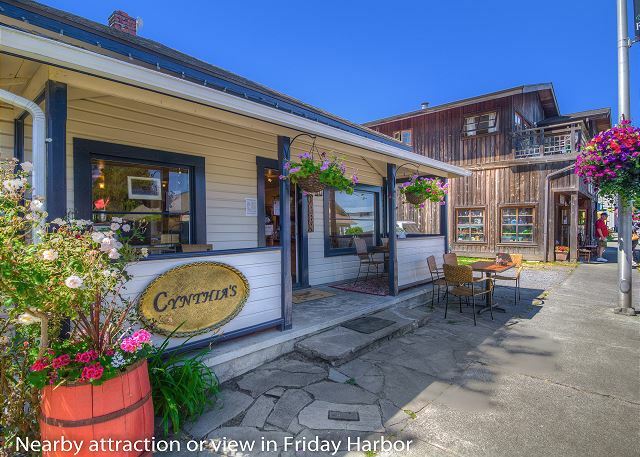 The house is within walking distance (about a mile) from the charming village of Roche Harbor, which is a resort town with a few shops and restaurants, centered around a lovely marina. We will keep this property on our list for next visit to the San Juans! We had a lovely time at this beautiful home on Neal Bay. Fabulous waterfront location with a chef's dream kitchen. 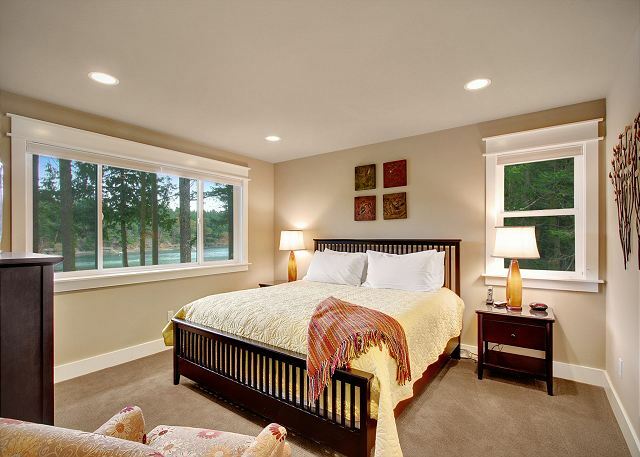 Roche Harbor Manor is a great place for up to 10 people to stay. The house is well stocked with kitchen and recreational items. Walk to Roche Harbor is doable if you're mobile - maybe a mile. The tide really comes in and out of Neil Bay, and as a result wildlife turns over all day. Only (mild) complaint is that the hot tub didn't get very hot. We arrived to a beautiful home stocked with everything you would need for a great vacation. The home was located close to Roche Harbor and about 12 minutes from Friday Harbor. The home was very clean and very well maintained. We were extremely comfortable there. We requested a couple of things when we arrived, and management came within 10 minutes. The home was situated in a very quiet area, and we would absolutely come back again. Highly recommend to anyone. Fantastic home and great location. street signage was difficult to follow, but with Chris's assistance, we found the home. Good location on the island too. I love this house! I stayed here with a group of 9 people and there was plenty of room. The kitchen is well stocked and big enough for all of us to work simultaneously. Great location and beautiful views from the deck. Relaxing in the hot tub in the evenings was a nice treat. I would recommend that anyone visiting San Juan Island consider staying in this property. What an amazing place and perfect for a gathering. We spent a good deal of time just hanging in the house because it was so peaceful and comfortable. Everything was thought of and provided - all upscale items. We adore everything about this house and as avid cooks, it is a dream! The kitchen is stocked with every convenience imaginable. We hope to come back again soon. This is the best rental house I've ever stayed in (and we've rented at least 10 in various places over the years). It lives up to everything you see in the pictures--spacious, comfortable, and beautiful. It sits on the water and walking along the rocks when it's low tide was a huge hit for the kids, especially with the nets that are at the house. 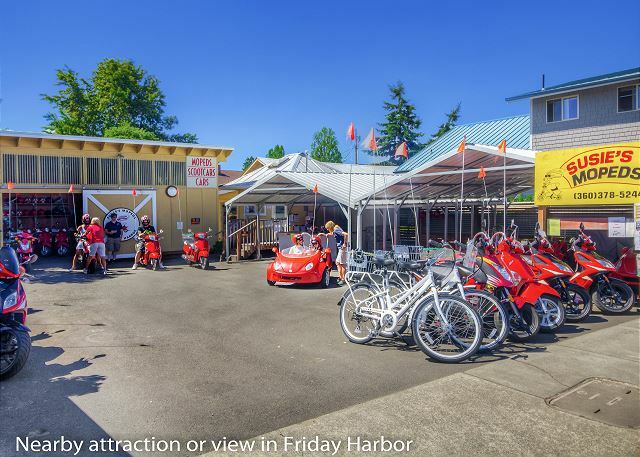 We also didn't realize that it was walking distance from several restaurants (2 casual and 1 fancy) at Roche Harbor, or what an asset it is to be near Roche Harbor: whale watching leaves from there, there's a playground, a pool, bike/kayak/scooter rentals, a neat sculpture garden, etc. It's about a mile walk to all that (or you can drive) which was just perfect. This is definitely a place we'd want to return! The home was absolutely beautiful and the location excellent. Aside from needing a few more bath towels (we were given 8 towels for 10 guests) and the housekeepers missed emptying a bathroom trash can, the house was immaculate and very well stocked. 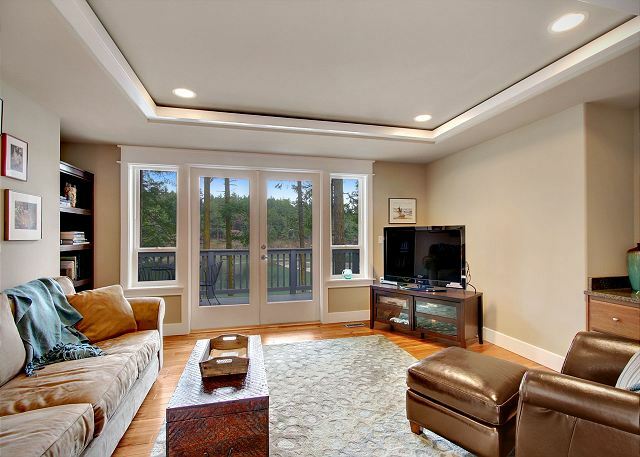 Roche Harbor Manor is one of the nicest rental properties we’ve stayed in! 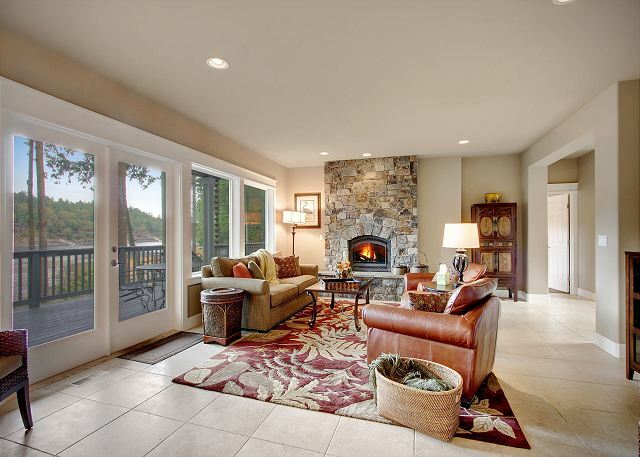 We had a wonderful time staying in this great Roche Harbor home. The home has everything we needed and there was plenty of room for two families to vacation together. Our only wish was that the water in the bay was less murky. Home was perfect for a family/wedding get-together. Bedrooms/baths were comfortable, and kitchen was beautiful and extremely well stocked. We would definitely come again if in the area. We go on vacation as a family of 10 with plenty of teenagers in tow and this house worked wonderfully! We loved the dining table big enough for 10 and the very usable kitchen equipped with everything we wanted. The walk to Roche Harbor is hilly and longer than I would have liked. The house had plenty of room for everyone to have some space. Wonderful time Neil Bay and Davidson Head is how I remember Roche very quite and relaxing but minutes away from all the fun at the Harbor. A spectacular home and property!!! We can't recall having a better trip! We wanted to get away from the hurry of our daily lives and business and got way more than we expected!!! The layout of the home was perfect for utilizing the view and the privacy of the forested surroundings. We spent most of our time in the chef's kitchen making big breakfasts and exceptional dinners with all the cookware and serving supplies we ever needed for our group of 10! The privacy of the bay, comfort of the hot tub and the incredible master shower, made us more relaxed than we ever imagined we would ever be! I would HIGHLY recommend this property to our friends! !